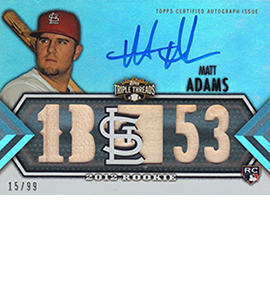 If you go strictly by stats, Matt Adams isn't a superstar. However, he does know how to come through in the clutch, something that has helped the St. Louis Cardinals continue to be perennial contenders post-Pujols. The power-hitting first baseman can also hit for a solid average and create runs. 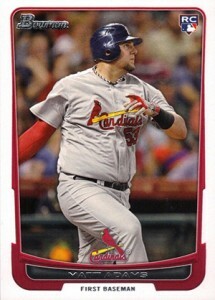 Matt Adams rookie cards aren't very expensive, but they could be in line for a bump if he continues to help the Cardinals work some postseason magic. 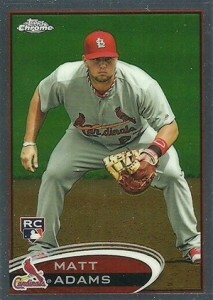 The Cardinals took Adams in the 23rd round of the 2009 MLB Draft, not normally the place teams find an eventual starting player. He made his debut with the team in 2012, appearing in 27 games. Since then, Adams has continued to play well but he hasn't shown any signs of becoming an elite player yet. 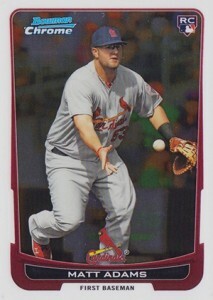 Matt Adams has a total of ten rookie cards from 2012. In addition to the base cards, most have rarer parallels. 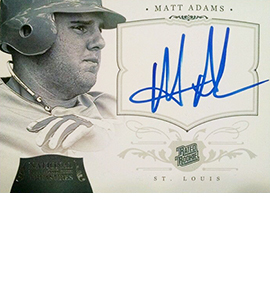 He also has a handful of autographed inserts that are also popular with collectors. 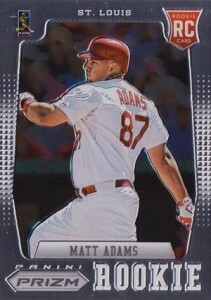 Adams' cardboard debut dates back to 2009. 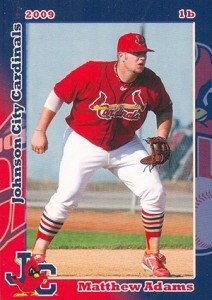 He appeared on a minor league card as a member of the Johnson City Cardinals. 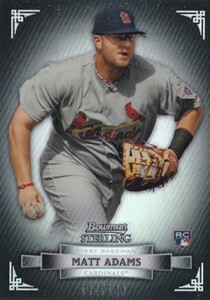 His first cards in a major league uniform came a year later with 2010 Bowman and 2010 Bowman Chrome Prospects cards. 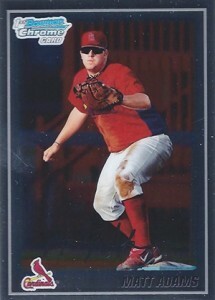 Save for a few extreme rarities, it doesn't cost much to get a Matt Adams card collection going. But with the reasonable prices comes room for growth. 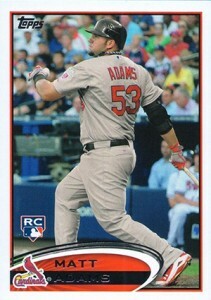 Even if Adams doesn't put up massive numbers, interest in his cards could rise with more postseason heroics. A couple of All-Star appearances could also raise his profile in the hobby somewhat. 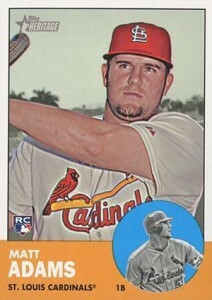 Below is a gallery of all ten of the Matt Adams rookie cards. 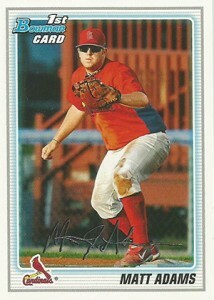 We have also included his first prospect cards as well. Click on the links to shop for specific cards on eBay. 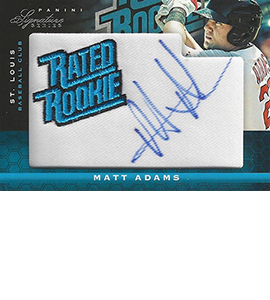 The following cards came out before Adams made his MLB debut. Because they're either inserts or minor league issues, they're not rookie cards.